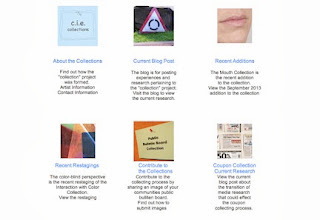 A segment of the “collection” project website has been revised and recently launched. The main revisions were focused on the home and about web pages. The intention for the redesign of those web pages was to increase public access to the accumulation of content from the research of the project. As I mentioned in the August 19, 2013, Considering the “content” in Web Design, blog post I was interested in presenting the project’s current progression with research and the investigations in participation. The blog post referenced a video from the 2012 MuseumNextconference that presented concepts concerning the redesign of museum websites to be a content provider to contemporary culture. I have acknowledged these “online” museum methods and borrowed aspects that would pertain on a smaller scale to the “online” presence of my “collection” project. I have featured six themes that organize the current matters of inquiry with the collection. They are listed below with a brief description of the significance. ABOUT THE COLLECTION – This page introduces the viewer to the background information of the project. The page has links to the collection statement, artist resume, and contact information. The links for the social media pages are accessible for viewers (if they choose) to be able to keep updated on the recent additions. I chose to remove the social media links from the home page, because I consider them as links to accessing the collection rather than contributing to the content. CURRENT BLOG POST – This is a link to my blog. There has always been a link to the blog on the project’s website, but the blog’s content has grown and consists of research and experiences pertaining to the “collection” project. RECENT ADDITIONS – This link to the most recent addition of the collection was on the original web home page. The monthly recent addition is one of the main points that creates continuous interaction with the website. RECENT RESTAGINGS – The opportunities of restaging the collection are with public intuitions, participant’s perspectives, and the use of variations with media. The most current restaging is presented with a link to the restaging webpage. CONTRIBUTE TO THE COLLECTIONS – This theme is related to the Public Bulletin Board Collection were participants can email and share an image of their community’s public bulletin board. Adding this theme to the home page gives this collection another opportunity to be noticed, along with engagement with the concept. COUPON COLLECTION CURRENT RESEARCH – The link to the most current research concerning the longevity of print media coupons and is made accessible because it brings attention to specific content of research located on the blog. These six themes currently introduce the investigations of the concept concerning the social interaction between people and objects. The revisions of content and redesign of selected web pages present a fresh presentation and indicates growth of the collection. The September 2013 Recent Additions of The Mouth Collection is posted with this launch of the web pages.